What I appreciated the most about Sleight was the fact that it was able to take a typical situation we've seen in movies before (i.e. : Getting caught up in the dangers of drug deals) and put a fresh take on it. As a fan of magic in general, it was really cool on how the magic was used in this movie. It wasn't over the top or crazy like in Now You See Me, for example. Instead it was all practical and realistic magic. This grounded approach to street magic really helps maintain the tone of the film and keeps the characters honest in a sense. When you finally learn the secret to Bo's magic tricks, it further supports the originality of this film. I'm a fan of Jacob Latimore's work, and I think he's definitely taking his next step in his acting career with this role. He can carry the dramatic moments in the film without it seeming forced. There's a very intense scene where he's poised to make a very difficult decision in the film. You can tell his performance was effective because more than likely, his expressions during that scene will probably get your own heart pumping as well. I've also got to give props to Dulé Hill for his supporting role as Angelo. I'm used to seeing him in more humorous roles (such as in the TV show Pysch) and serious roles (such as in The West Wing). This was the first time I could recall seeing him play a rather convincing bad guy. He was definitely ruthless and intimidating as the drug dealer who causes Bo a lot of trouble. There were a bit of pacing issues that created some slow points in the movie. It's kind of hard to put my finger on, but many of the characters felt a little rushed in terms of their development. It was almost like when we first get to meet them, we're then quickly shown their dark secrets or their true nature. Despite the fact that the movie was only an hour and a half, it still feels longer than it really is. Beyond that, there are only a few minor twists in the film, but overall it's still rather predictable. Towards the end of the film, I was kind of hoping for a bit more of a climatic ending, but it really felt more like a short-lived tease when Bo finally confronts those who were giving him trouble. I thought that the film could've really benefited from showing Bo's intellectual prowess beyond just his "one major trick". I just wanted to see more from the character in general. At the very least, there could've been a bit more of a hint of actual magic that would leave the audiences still in awe. Director/writer Dillard does an excellent job of blending genres with this film. He was able to construct and portray a story that reflected real life situations, with a genre that we don't usually get to see minorities play. 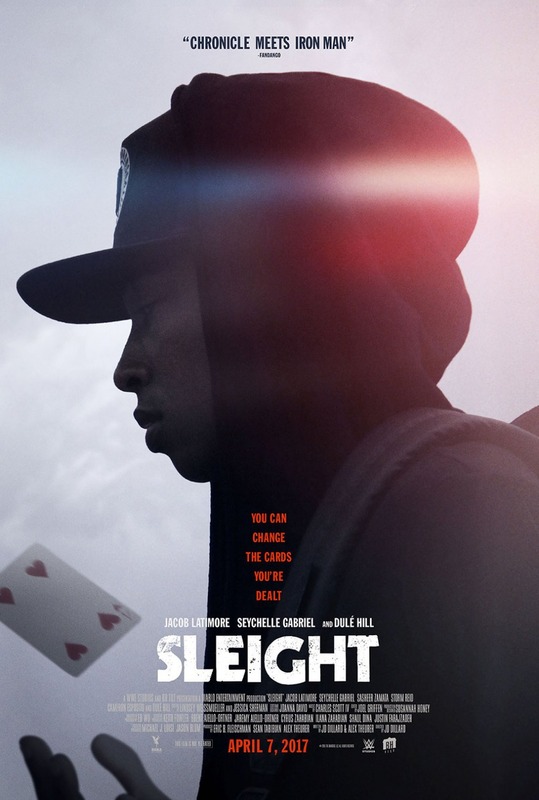 Sleight is a solid film but I don't necessarily see it breaking any box office records. I do believe that it is still worth the watch. I'd probably say that this would be make for a good matinee watch on a Saturday night.